As state-of-the-art imaging technologies become more and more advanced, yielding scientific data at unprecedented detail and volume, the need to process and interpret all this data has made image processing and computer vision also increasingly important. Sources of data that have to be routinely dealt with for today’s applications include video transmission, wireless communication, automatic fingerprint processing, massive databanks, non-weary and accurate automatic airport screening, robust night vision to name a few. These technological advances were closely followed by the increase in computer power of traditional, von-Neumann architectures. However, a major concern is that such architectures are efficient for specific computations such as retrieving an item in a database, or apply a precise sequence of operations. These usually fail when the application becomes closer to biological vision, such as the categorization of images independently of changes of lightning, movements, changes in the environment or the imaging device. Surprisingly, while computers can handle most complex tasks (such as computing hash numbers, logarithms and linear algebra), most of the time, the “simpler” the task is (such as “find the animal in the image”), the more complex it becomes to implement on a computing device. Multidisciplinary inputs from other disciplines such as computational neuroscience, cognitive science, mathematics, physics and biology had and will have a fundamental impact in the progress of imaging and vision sciences. One main advantage of the study of biological organisms is to devise very different types of computational paradigms beyond the usual von Neumann architecture, e.g. by implementing a neural network with a high degree of local connectivity, which may be more adapted to solve the problems of modern imaging. This book provides a comprehensive but rigorous reference in the area of biologically inspired computer vision modeling. Biologically-inspired vision, that is, the study of living beings’ visual systems, can be considered as a two way avenue. On the one hand, living organisms can provide a source of inspiration for new computational efficient and robust vision models and on the other hand machine vision approaches can provide new insights for understanding biological visual systems. Along the different chapters, this book covers a wide range of topics from fundamental to more specialized topics. Following the classical Marr’s premise for vision of three levels of analysis based on a computational level, an algorithmic level and a hardware implementation level, this book also analyzes the influence of these studies in the design of novel, more advanced vision sensors. In particular, the last section of the book provides an overview of few representative applications and current state of the art of the research in this area. The scope of this book somewhat overlaps with a few other books published in this area, most of them corresponding to conference proceedings. 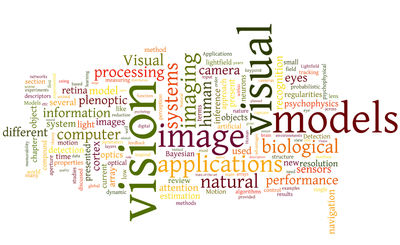 Most recently, several special sessions on this same topic were organized at different workshops such as the “Biologically-consistent vision” in conjunction with the 2011 Computer Vision and Pattern Recognition Conference and the “Biological and Computer Vision Interfaces” in conjunction with the 2012 European Conference on Computer Vision. The first monograph on this topic was published more than 20 years ago and therefore does not reflect the latest advances in the field. A very good reference in the field is the book by Frisby & Stone that provides the foundations of the computational and physiological research on vision. Another relevant reference is the book by Petrou & Bharath although it is more focused toward specialized hardware both at low-power and high speed. A more recent reference in the area is the book by Pomplum & Suzuki which is more focused on specific aspects of visual function such as attention, binocularity or cortical structures. 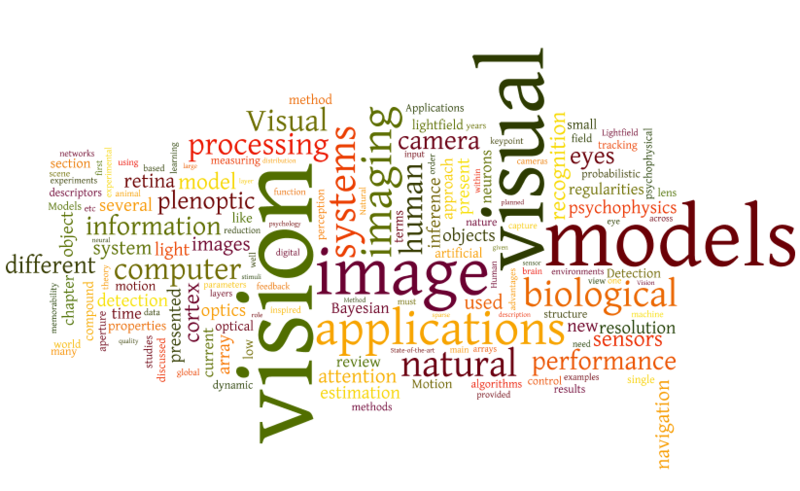 At the time of writing, it is worth to mention a special issue on bio-inspired imaging which highlights recent progress in the domain of vision and biological optics. As a consequence, this book is valuable for both undergraduate and graduate students but also for specialized researchers by tackling information that is usually spread out in different sources in a single and comprehensive monograph. Why should we be inspired by biology? A central question that can be formulated in this area is to understand why and how it is useful to build technical systems with a biological inspiration? Or putting it in other terms, why should biologically-motivated studies be useful for constructing artificial systems? It is clear that living systems are a continuous source of inspiration. In this book, we will try to cover few examples of how such biological findings will be of direct benefit e. g. for engineering new devices and sensors. More generally, the main motto of this book is to provide some insights on the “two-way avenue” analogy previously mentioned. On the one hand there are chapters were findings from biology, neurobiology or psychophysics are guiding the development of computer vision algorithms and on the other hand there are other more technical chapters that are motivated by biology. In general, we can argue that Nature has been continuously a source of inspiration not only for constructing artificial vision systems but also in other domains such as material science. The coined term “biomimetics” is the field of science and engineering that seeks to understand and to use nature as a model for copying, adapting and inspiring concepts. 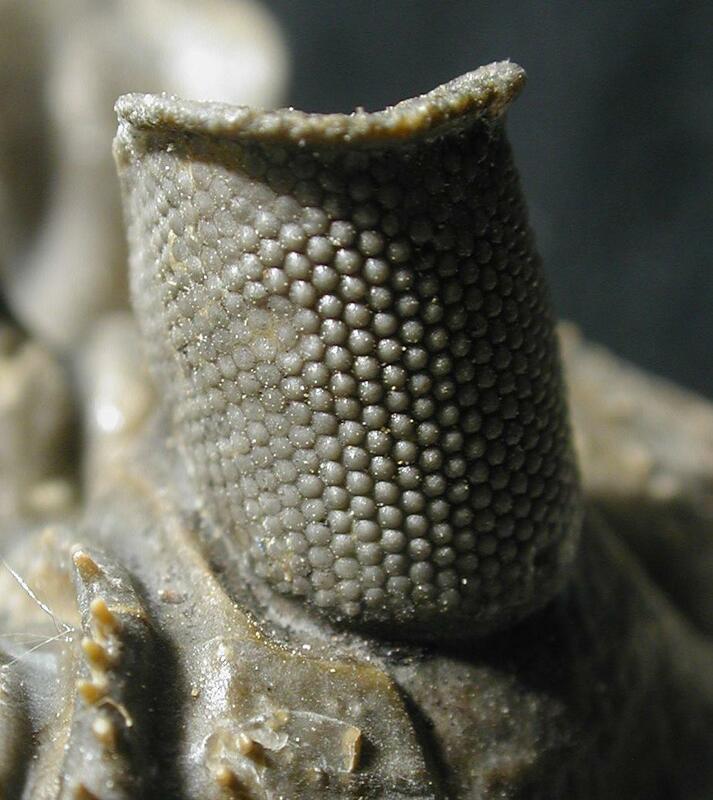 An early amazingly Nature’ design can be observed in the Erbenochile erbeni a Devonian trilobite with calcite-derived compound eyes allowing the animal to see not only 360 degrees on the horizontal plane but also to cover a significant vertical area. Even more intriguing is the fact that their eyes have eye shades and blocking glare which suggest that trilobites were diurnal and not nocturnal (see Fig. [fig:erbeni]). In some cases the visual system of some organisms surpasses the human visual system’ performance. As such, it becomes clear that a clear advantage of living organisms resides in evolution and natural selection. This led to efficient solutions to many of the challenges they face. Therefore, humans always make efforts to use nature as a model for innovation and problem solving. But here is more to it. For instance, the peacock mantis shrimp’ eyes (Odontodactylus japonicus) are capable of serial or parallel vision, trinocular vision, depth perception and the color vision is extended to the ultraviolet and infrared ranges (see left cover image of this book). They also exhibit at least sixteen different photoreceptors and detection of polarized light and circular polarized light. Inspired by the mantis shrimp’s compound eye and polarized vision, an international team of researchers have recently built a miniature sensor that can detect subtle differences in early stage cancerous cells from in vivo endoscopy of mouse colon. The eyes of other animals use other strategies to solve predatory tasks. The jumping spider use special staircase-shaped retinas to produce sharp and out-of focus images simultaneously (see right cover image of this book). By comparing the focused and defocused images the spider can estimate depth through unmoving eyes. Nagata et al have developed a mathematical model that predicts the accuracy of the jumps for different wavelengths. These recent promising results could open up new avenues both in mathematical modeling and signal processing for more challenging applications. In the context of animal vision studies, Land & Nilsson’s book provides a fascinating comparative account of the evolution and function of animal eyes with emphasis on the optical system description. Also, a very recent book on the same topic is Cronin et al’s book. As a consequence, biologically-inspired computer vision is not only about mimicking the structure of animals’ visual systems, but to gain insights from the vast range of different solutions that emerged through natural selection to provide efficient solution to vision-based problems. The cross-links between the different chapters have been sketched in Fig. [fig:mindmap]. This book aims at providing an overview about bio-inspired computer vision bringing together from fundamentals to the most recent advances and applications in the field. The three chapters selected in the Applications section are good representatives of how the transfer of ideas from biology to computer vision can be done in practice. Fig. [fig:tagcloud] shows a picture of a tag cloud that has been generated from the table of contents of the book. 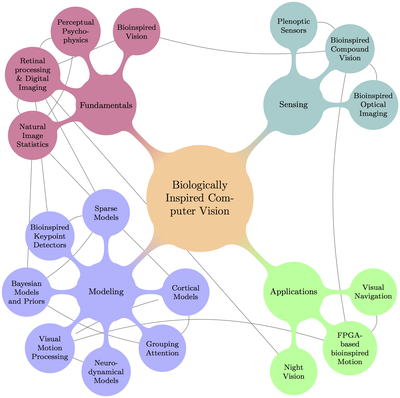 Chapter 1 describes the basic bioinspired vision technology with the aim of outperforming conventional frame-based vision systems in many applications fields. It provides an overview of biosensors and neuromorphic retinas. Chapter 2 describes how the retina is able to process much more complicated information processing that were initially thought. Chapter 3 describes how natural image statistics can be exploited to effectively improve visual inference in computer vision systems. Chapter 4 provides the basics of visual psychophysics i.e. how to measure the performance of observers in predetermined visual tasks. In chapter 5, algorithms inspired in the compound eyes of insects based on sensing the polarization of light are described, illustrating how this can be modeled to enhance the visual perception of standard cameras. Chapter 6 describes how natural concepts for miniaturization could be imitated for building computer vision systems with perfect adaptation to as small size, special tasks and specific applications. Chapter 7 describes the basics of plenoptic sensing and how these new devices can extend the capabilities of current standard cameras. Chapter 8 describes Bayesian models as a useful modeling approach for describing perception and behavior at the computational level. Chapter 9 explains how neurodynamical models could be used not only as biologically inspired models for processing images but also for explaining perceptual phenomena. Chapter 10 presents models of bottom-up visual attention and their applications. Chapter 11 presents a review of several recent studies focusing on the integration of retinal and extra-retinal information for visual motion processing and human tracking behavior. Chapter 12 describes cortical models for image recognition mainly based on the HMAX architecture of Riesenhuber and Poggio. Chapter 13 describes how bio-inspired approaches may be applied to computer vision problems using predictive coding schemes focusing on sparse models as simple and efficient instances of such models. Chapter 14 describes methods for extracting and representing key points motivated from a biological standpoint. Chapter 15 describes how by mimicing neural processes of nocturnal animals, efficient computer vision algorithms can be devised. Chapter 16 provides an overview of elementary motion detectors (EMDs) oriented to computer vision applications when resources available are limited (e.g. power consumption). Finally, chapter 17 describes in detail a bioinspired model (ViSTARS) oriented to visually guided navigation in a cluttered world. Biological vision shows excellence in terms of performance and robustness. Following one of the recommendations of the book referees, one of the aims of the book is to make it multidisciplinary although perhaps in the future the topic of biologically inspired computer vision could become a single discipline by itself. One of the reasons of the resurging interest in the topic of the book has been both the availability of massive computing power (e.g. cloud computing) and high performant computing power (GPU, FPGA, etc). This has been illustrated in the chapters [016_oskarsson, 017_tim_tiedemann] of this book. For the reader’s convenience, there is an accompanying website with supplementary material. It contains selected MATLAB and Python codes, testing images and errata. We would like to express our appreciation for the quality of chapter delivered by the authors and for their efforts to keep the chapter length within the limits given. This project has not been achieved without the valuable contributions made by a significant number of experts in the field from both the academia and industry. We are grateful to their willingness to contribute to this groundbreaking resource. We would like to extend thanks to all the Wiley VCH members that help us managing the project and in particular to Val Moliere for her enthusiastic support. We want to express also our gratitude to Roy L. Caldwell and Thomas Shahan for providing us the macro pictures of the book cover (Odontodactylus japonicus male (left) and Phidippus audax male I(right)).